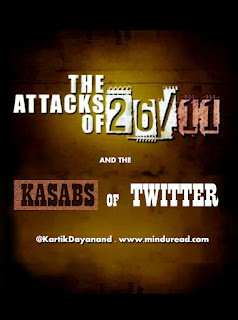 The Attacks of 26/11 and The Kasabs of Twitter! As you can notice from the title this isn't just my take on the Ram Gopal Varma movie 'The Attacks of 26/11’ but also my take on a trend that I have been noticing for a long time on Twitter. 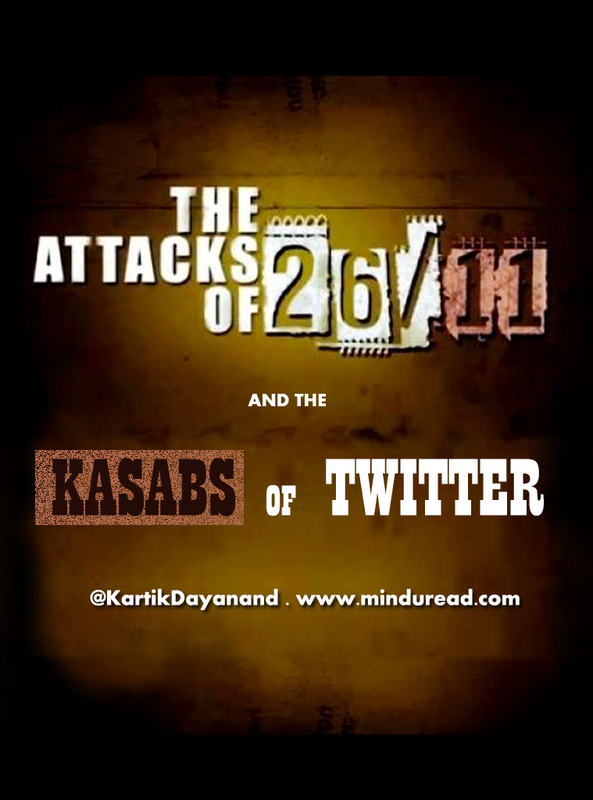 If you are only interested in reading about the movie you can skip the second part of this post and if you want to read only about the other burning issue that I speak about in this post ‘The Kasabs of Twitter’ you can skip the first part but I would suggest you read it in entirety so that it makes better sense. I will leave the choice to you. I shall first start with the movie. Curiously, out of all the movies ‘The Attacks of 26/11’ reminded me of Titanic. Titanic was also based on a real life tragedy where the aged Rose recalls events of the past much like how Nana Patekar narrates the events of 26/11 as the Joint Commissioner of Mumbai Police in this movie. However, the similarities totally end at this point as Titanic had the advantage of weaving a fictional story into the past that brings us closer to the characters emotions. RGV does not employ this technique and takes more of a third person’s point of view. This in a way robs the movie of an emotional connect as the viewer does not invest himself into the characters on screen though the body count keeps on rising. I was unmoved yet hooked onto the proceedings only due to the sheer novelty of watching the recreation of a real life event on celluloid. At one point of time I even wondered why RGV made this film until the final punches came in the last few minutes of the film. The scenes in question did not involve any stunts or heroics yet the audience clapped like they would for a Salman Khan entry scene. My dissatisfaction and incompleteness regarding the rest of the movie vanished once those scenes got over. The punches involve two scenes, one in which Kasab speaks at length about the beauty of jihad and how his aaka told him glorious stories about martyrdom. Jeet gaye to ghazi nahi tho shaheed he is told. Kasab is blind in his devotion to the cause of jihad and that explains the mindless killings we are shown throughout the film until that point. Through Kasab’s voice RGV exposes us to the mindset of every jihadi out there to kill innocents in the name of religion! Once he establishes this reasoning I realised it was pointless to show further violence at the other locations like Nariman house, Trident hotel or the hostage situation at Taj which were missing from the film. This movie wasn't meant to titillate the audience and show some heroic stuff of NSG commandos snuffing the terrorists out or something like that, that would have made a more compelling drama, instead RGV sacrifices drama and goes finally to the root of the problem, the mindset of a jihadi. In the next scene RGV gives the perfect counter to expose the futility of jihad and through Nana Patekar’s outstanding monologue strips down every notion of glory associated with the idea of misguided and mindless jihad in the name of Islam. The points are established so powerfully that it is no surprise everyone in the auditorium clapped instantaneously. It seemed like RGV made the entire film only to establish these powerful points as a wakeup call to every potential future terrorist! I feel anyone who says RGV was out to milk a tragedy by making this film is totally missing the point and is doing a great disservice to his efforts. According to me their ignorance in understanding the film is no different from the ignorance that plagues Kasab. Couple of years back I wrote a post called 'Inception: Myth behind the Myth' based on the movie Inception where I spoke about the nature of the mind and how one is constantly conditioned by the things one is exposed to in life. Advertising and marketing is a form of this inception where we are led to like and believe certain things without giving much weight to logic. Bigger the star, bigger the level of inception; our whole material world is constructed on this very notion of controlling mind space. Same is the case with media outlets too. However due to advent of social networks the power equation got adjusted dramatically and there was an even balance of power distribution. This however has led to a problem of a new kind, the uncontrolled and unaccountable nature of the beast called Social Networking. The first thing most of us do these days is to look at tweets on Twitter to gauge the reactions to any movie or event in real time. The stars given by critics already finish half the job and the rest is taken care of by the Twitter army. Their favourite weapon is called sarcasm and no matter what the merits of any film, they will ridicule it as it is their only way to get maximum retweets and followers in return. I am not exaggerating when I say that all the top search results that I noticed on Twitter for ‘The Attacks of 26/11’ were from parody accounts or from known jokers (sorry to use that term but that is what a majority of them are, jokers). Worst part is these jokers have an army of ignorant followers latching on to every word throwing all logic and sense to the wind! This isn't to do just with this particular movie, they have successfully targeted every other celebrity out there either by sarcasm or pure misguided bile all in the name of free speech. Politicians, film stars and journalists are the favourite all time punching bags. Ask a Rajdeep Sardesai, Sagarika Ghose, Barkha Dutt or a Shashi Tharoor, Chetan Bhagat or a Karan Johar or Ram Gopal Varma how they are branded and attacked constantly on Twitter, they would have interesting stories to narrate. Poor Shah Rukh Khan doesn't even want to log on to Twitter ever again thanks to the same problem. Having said that, there are also plenty of reasonable voices on Twitter but they tend to get drowned in the cacophony of sarcasm and wit. In most cases they end up having real life consequences too. No wonder that even governments are gearing up to have their own Twitter armies online (did I hear someone say Narendra Modi?) because that is where the mind games are all being played right now and they know that what happens on Twitter today is tomorrows headline news. For they entertain for the most part, can turn into an effective army like the one from Ramayana in their fight for just causes but in most cases are just being plain monkeys lacking the capacity to think like humans or shall I just say, they are the Kasabs of Twitter.